Keneth Baker (F.A.K.Baker) (died 9.5.1947, aged 27) Assistant to Major G.W. Clark in No. 3 company of the Non Combatant Corps. Baptist. T.B. Bishop (Tom Bond Bishop) Customs. Joined Joseph Spiers in the Children's Special Service Mission. A "meticulous organiser". A founder member of the Civil Service Prayer Union. He is number 89 in the first Minute Book members list. Located in the Secretary's Office at the Custom House, E.C. There were about 70 members of the CSPU in the Custom House between 1875 and 1883. He served on the Committee of the Prayer Union from July 1881, resigning in July 1889 due to "over-work". He is last entered in the List of Members (at the Secretary's Office) in 1891. David Brady informs me that T.B.Bishop edited Our Own Magazine and Scripture Union, wrote Evolution Criticised (Oliphants, 1918) and was the subject of Tom Bond Bishop by Percy Sitters (1923). Stevenson Arthur Blackwood (Sir Arthur Blackwood) (born 22.5.1832, died 22.10.1893), the first President of the Civil Service Prayer Union. S.M. and Mrs Blackwood, 1896 Some Records of the Life of Stevenson Arthur Blackwood, K.C.B "Compiled by a friend and edited by his widow" Popular Edition. London. Hodder and Stoughton. Dane Skilling 1972 Sir Stevenson Arthur Blackwood, K.C.B. and the Origin of the Civil Service Christian Union Seven page type manuscript, including bibliography, sent to Edwin Roberts 18.2.1972. James Johnstone Bourne, War Office. A committee member of the Civil Service Prayer Union. Died Switzerland (July?) 1892, after he had retired from the War Office. Brother of Stephen Bourne. Anglican. Active in the Church Missionary Society. "Mr Bourne combined an unflinching maintenance of his firm convictions on such matters as the non- sacerdotal character of the Christian ministry, the full inspiration of all holy scripture, and the sanctity of the Lord's Day, with perfect freedom from all acrimony, and a constant manifestation of all that was gentle, generous and good." (Civil Service Prayer Union Quarterly Paper October 1892). Stephen Bourne Customs. A founder member of the Civil Service Prayer Union. Vice President. Brother of James Johnstone Bourne. He is number 91 in the first Minute Book members list. Located in the Statistical Department at the Custom House, E.C. He had retired from the Civil Service by 1891. Geoffrey Brough Bomb Disposal Unit. United Nations Witness Team organist and musical director. Baptist. "In February or March, 1945, I heard about the G.I. 's Bible Class from a young lady at Bloomsbury Central Church, and eventually went along. The very first night there, I played the little organ for the "Singspiration" Session and became a regular attender once a fortnight. F. B. Campbell. Hon. Secretary Civil Service Prayer Union for one year to November 1889. Between Mr E.E. Heathfield and Henry Hill. Tom Chalmers City of London Forces Witness Team. From Scotland. Tom Chalmers wife, May Chalmers, died in childbirth in the spring of 1946. His son died of diphtheria 1.12.1948. Brethren. Charles Christensen (Chuck): S/Sgt. USA Army, stationed in England 1943 to 1945. Introduced City of London Forces Witness Team to the The American Bible Class in 1944 - thus making the United Nations Witness Team possible. On the rally committee for Youth for Christ 18.8.1945 and reported on the Bible Class to the UNWT meeting on 1.10.1945. Chris was the Song Leader. "In England, during the war, I sensed the value of radio for communicating the gospel" which became part of his career when he returned to the USA. He married Winnie Ennglund in 1952. Chair of the Department of Communications at Moody Bible Institute. Washington Reunion 1994. Christensen, Charles and Winnie, 1990 Careful! Someone's Listening. Recognising the importance of your words. Moody Press, Chicago. 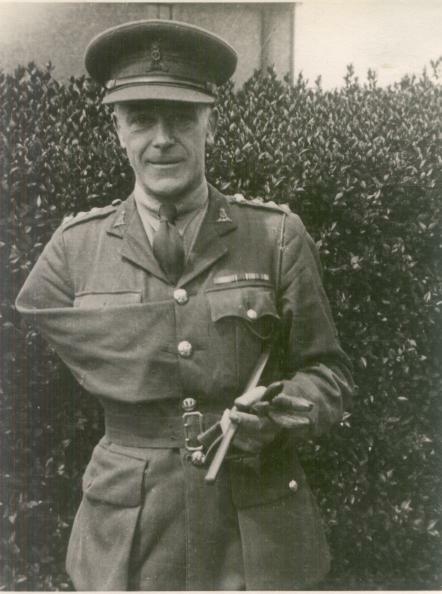 Gilbert W. Clark (died 19.8.1962, aged 76) Major G.W. Clark, M.C., Officer in Command No. 3 company of the Non Combatant Corps 1940 to 1946. Robert Samuel Code (born Dublin 1896, died 12.12.1966), Civil Service Christian Union. Active before and during the war in the Land Registry and Central Office of Information branches. Lived at 29 Bond Gardens, Wallington, Surrey in 1958. "Civil Servant (Retired)"
"when a new Committee of the Union was formed in 1946 to strengthen the cords which had become so thin during the war he became the first General Secretary and threw himself into the work of reconstruction. In 1950 he became Vice-Chairman of the Committee and in 1957 the Chairman" (Obituary in Service January Match 1967. He resigned the chair in 1960, but remained active in the Union until just before his death. Brethren. Elder at Ross Road Hall, Wallington. Mr. E. Musgrave Craven, MA, died 27.3.1954 aged 73. Customs and Excise. Secretary of the Civil Service Prayer Union until the merger in 1923. "Well known in evangelical circles in St. Albans, where he lived for many years". Service July 1954, p.43. Minsterley, Hall Place Gardens, St. Albans, Herts. Rt. Hon. Baron Daryngton of Witley, P.C. (H. Pike Pease until 1923). (born 1867, died 10.5.1949). Conservative MP. Assistant Postmaster General 1915-1922. President Civil Service Prayer Union from 1917. President of Civil Service Christian Union until his death. Anglican An Ecclesiastical Commissioner. Strong associations with the Church Army. Obituary by P. T. Shorey, Service July 1949. George Dempster Service October 1953. But his prose is not always explicitly religious. Springtime in England (January 1950) links only gently to Easter and Alderney the Carefree is just a guide to the beauty if the island. The comedy even seems to re-emerge in Pulpit References (July 1949) when he discusses the advantages of cutting up old Bibles with a sharp pair of scissors. Clive Edwards For 3 and a half years, a lieutenant in No. 3 company of the Non Combatant Corps. Sir J.C.L. Edwards, Bart. Philip Elliot OBE, died 27.7.1987, aged 95 years. Civil Service Christian Union. Edwin Roberts to, 7.11.1977: "You, Timms and I must be the only survivors of that interim committee that was formed in 1946 to get the Union moving again." Worked in the Crown Agents for the Colonies from 1911 until his retirement in 1952. Joined the Junior Civil Service Christian Union in 1910. A missionary secretary in 1927. Joined the Union's Executive Committee in 1945. Originally Exclusive Brethren. Claygate Evangelical Church. Resident in Claygate, Surrey from 1926. "Stanley Ellison was a soldier during World War 2, first in the Coldstream Guards, where he was a sergeant, but after a severe illness he was first kept in London on Royal Palace guard duties and then transferred to the Royal Army Pay Corps, also in London. Here he joined with other Christians in the fellowship of the Soldiers and Airman's Christian Association and then in the United Nations Forces Witness Team in which men and women of many nations witnessed, to wide audiences in the London area, to the saving and keeping power of the Lord Jesus Christ. Stan joined enthusiastically with two others of the Team in the conception and development of the Victory Tract Club - Graham Cox with the editorial and promotion work, Raymond Pestell for the art work and Stan for administration, with the support of the Victory Press. After Graham and Raymond had moved to other fields, Stan remained with the Tract and Poster Club until his last illness." His funeral was at New Life Christian Centre, Cairo New Road, Croydon, on Friday 10.2.1995 at 12.30. Mary Farrer married Ernest Thompson: Mary Thompson: Washington Reunion 1994. died 11.9.1995. M.G. Gladden Missionary (Financial) Secretary Civil Service Christian Union. Appointed 1924/1925 with F.A.Tatford. "All communications and gifts should be sent to... Mr M.G. Gladden at 8 Dorset Road, Harrow, Middlesex". (Quarterly Paper July 1925 p.44). In the structure of 1931 he was Foreign Missions Secretary - with two assistants. Gordon Gooderson, United Nations Witness Team. Stella Hardy Civil Service Christian Union. Worked in the Crown Estate Office before marrying Anthony Hardy. They work together on union administration. Ernest Frank Hawkins died 1954. Ministry of Labour then Ministry of Health. A keen supporter of the Kew and St. James's Park Branches of the Civil Service Christian Union. Disability sustained in the first world war prevented him "taking a public part in Christian work". Wrote devotional poems. "J.L." (John Lidbetter?). Service January 1953 p.8. Reginald Arthur Heywood (Autumn 1898- Spring 1969 Assistant Treasurer and then (1946 to 1954) Treasurer of the Civil Service Christian Union. Then a Vice-President. 18.11.1954: "I think I have been a member of the Committee for about 35 years". Joined the Junior Civil Service Christian Union soon after entering the Civil Service in 1914 "and was appointed to the committee. He was a member of the committee which arranged the amalgamation of the JCSCU with the Civil Service Prayer Union in 1923, and after that a member of the CSCU Committee." Secretary and Treasurer of Orange Street Congregational Church until 1956. Also Christian Brethren. Ross Lane Assembly, Wallington, Surrey. Service July 1954 p.44 and letters. Died 1969. Funeral Friday after 5.3.1969. Mr Timms represented the CSCU. Henry Hill (died 16.8.1916 aged 76). India Office. Hon. Secretary Civil Service Prayer Union from November 1889 in succession to F.B.Campbell. Maud Holmes Editor from October 1966 to 1986 of Ministry, a quarterly duplicated magazine for members of the Northern Ireland branch of the Civil Service Christian Union. E. E. Heathfield. Probate Division. Address in 1885: Holmthorpe, Upper Norwood. S.E. Original Hon. Secretary Civil Service Prayer Union. Succeeded by F.B.Campbell 23.7.1888, when he asked to be relieved (at least for twelve months) due to "the state of his health and Medical advice". He suggested the appointment of Mr Campbell of the British Museum, who was recommended by the Chairman. (Minutes 23.7.1888). Mr Heathfield had been present at the previously minuted meeting on 17.11.1887. William Stanley Hocking OBE died 5.10.1984 in his 91st year. Treasurer Civil Service Christian Union. A Vice President from 1963. Lived at Bristol House, Danbury, Chelmsford, Essex in 1958. "Retired Civil Servant". Harry Alfred Victor Horsey born 16.12.1891 died 12.1.1976. Worked for the Post Office from 1908. One of the two London Secretaries in the Civil Service Christian Union structure of 1931. Later Missionary Secretary to 1958. "he was a member of the committee when I joined it in 1946 and we began the work of reconstruction after the war." (Letter to Mrs Horsey [sister?] from Edwin Roberts 13.4.1976). "I joined the Junior Civil Service Christian Union as a boy clerk in 1908 and I am deeply thankful to God for all the help and inspiration the JCSCU and CSCU brought to me as a serving Civil Servant, and now brings as a retired Civil Servant. It seems a crowning blessing to be asked to serve as a Vice President in the golden jubilee of my entry. I hope Miss Duncan enjoys the Missionary Secretary's job as much as I did. There is no end to correspondence and contacts in that job." (Letter to Edwin Roberts 7.2.1958). William S. Kerr Died September 1971. Vice President of the Civil Service Christian Union from 1966. Representing Scottish area. Sir George Anthony King MA (born 23.10.1858, died 17?.1.1928) President of the Civil Service Christian Union. Anglican. Freemason. Mr. George F. Lane, "G.F.L." (died 22.3.1951, aged 63) Secretary of the Junior Civil Service Christian Union and Civil Service Christian Union 1917 to 1946. Huntingdon Stone (died 1916), the head of Peak Freans Biscuits, was a patron of Christian Brethren Missionaries. There is a photograph of George Lane as a young man with ten of the Huntingdon Stone students (Echoes of Service). His older brother (? ), Frederick Lane, and his wife, were amongst the first Brethren missionaries to Central Africa (1889-1929). 19 Jasper Road, Upper Norwood, SE19. Linkside, 58 Ford Bridge Road, Ashford, Middlesex. Joined the Charity Commission in 1904 as a boy clerk. He was the JSCU's Representative Member at the Charity Commission 1905. He became a permanent Civil Servant in 1907/1908 and moved to the Board of Agriculture and Fisheries. He joined the Junior Civil Service Christian Union in 1904, (introduced to it by W.H. Wood) served on the committee two years later. (He was Temperance Secretary 1907 in place of Mr Docker). In 1910 he was also Cricket Club Secretary. In autumn 1913 he relinquished the post of Temperance Secretary. His Obituary in Service July 1951 says: He became Rambles Secretary in 1908. From 1910 to 1916 he served at various times as Missionary Secretary, Temperance Secretary and Cricket Club Secretary. In January 1917 he was appointed Assistant Secretary and, two months later, General Secretary. [Succeeding H.B. Parris] In 1917 he was also appointed to the Committee of the Civil Service Prayer Union. He was prominent in the amalgamation of the two Unions in 1923. Initially Joint Secretary of the combined Union with E.M.Craven, but Mr Craven became Treasurer after a few months and the Secretaryship was shared with Miss E. Negus. She became Registration Secretary in 1931, Mr Lane remaining General Secretary. He resigned as General Secretary in 1946, when he was appointed a Vice- President, and retired from the Civil Service on 30.4.1949. Brethren (Greenwich, West Norwood, Staines). Congregational. Mrs Aimee L. Leggat (previously Miss Aimee L. Wall). Active in the affairs of the Civil Service Christian Union before she resigned from the Civil Service in 1927 [1937?] to go to Argentina as a missionary. In 1951 she was working with her husband "principally among the Indians in Maimara... in difficult conditions and [a] trying climate". In Service May/June 1967, the Missionary Secretary wrote: "With her husband she has worked among the Indian people of the villages. They are stationed at Tartagal where there is quite a large Gospel Hall." In December 1970, "Mrs Leggat wrote to say she was returning to England because of ill health." (Service September/October 1971). Christian Brethren. In 1936 J. Lidbetter of the Ministry of Labour was a member of the CSCU Council, due to retire in 1938. On 17.7.1957, in a letter to James Payne, Edwin Roberts spoke of "John Lidbetter, who I believe was with you at Kew, and is now with the Ministry of Labour in Lancashire, based on Manchester and living in Southport. As a travelling officer he serves as a sort of CSCU 'ambassador at large', picking up new members here and there." Retired from the Civil Service in 1961. Became (unpaid) regional secretary for Emmaus Bible School for the North of England and Wales. From 1961 to 1967, he wrote a "fellowship letter" For the CSCU which went out with Service to isolated serving members, not linked to a branch. Raymond Watts took over this task in 1969, when John Lidbetter's first wife was very ill. From July 1977, John wrote a "Retired Members Fellowship Letter. Dr D. Martyn Lloyd-Jones (died 1.3.1981) Presbyterian Church of Wales. Minister of Westminster Chapel, London, from 1938 to 1968. By permission of Martyn Lloyd-Jones the United Nations Witness Team, and Youth for Christ, used Westminster Chapel for its largest rallies. Martyn Lloyd-Jones refused to participate in "the crusade style evangelism that swept England from Harringay onwards" because it "coupled unbiblical techniques with a patronage that compromised the gospel". He believed that evangelicals were compromised by the ecumenical movement and, from 1966, called on them to leave their denominations and join in evangelical unity. (The Evangelical Magazine of Wales April 1981) In 1995, members of the of the United Nations Witness Team, attending the United Kingdom Reunion, were welcomed to Westminster Chapel by the new Minister, Dr R.T. Kendall. Captain H.Sidney May (89 years old in 1987) Assistant Secretary The Army Scripture Readers and Soldiers and Airman's Christian Association for 23 years to 1968. Married Grace King in 1947. Alan Morrell Born Canada 1921, but came to England at an early age. United Nations Witness Team. Joined team quite late and continued with until the end. Song-leader in succession to Charles Christensen. Miss Elsie Negus, 20 Kempshot Road, Streatham Common, SW16. Born in Streatham in the spring of 1890. Christened in the Church of England. Her father was a commercial traveller selling varnish and her mother later (1911 census) became a shorthand typist with a metal merchant. Elsie worked at the Board of Agriculture. I think she came into the Civil Service Christian Union from the Civil Service Prayer Union. She was joint secretary with George Lane and then Registration Secretary. An active member of the executive committee up to the second world war, but stood down as Registration Secretary in November 1938 due to lack of time for the work. She died 30.1.1957. Ronald Olson United Nations Witness Team. "I was a wounded infantry soldier...and you took me in. I came scarred, traumatized by 5 months on the front lines, and returned to my outfit on the line in Germany with renewed faith...I clung to the promise of Psalms 118:17 `I shall not die, but live, and declare the works of the Lord.'" H.B. Parris Secretary of the Junior Civil Service Christian Union from 1910, in succession to W.H. Wood), to 1917, when he became a conscientious objector and resigned. Succeeded by George Lane. Became Rev. H.B. Parris. As a Baptist Missionary Society missionary, he left England in 1922 for Yakusa in the Belgian Congo. In 1951 he "was until recently  labouring with Mrs Parris in Stanleyville about fifteen miles up river from Yakusa, but has now returned permanently to this country." (Service July 1951). He was the speaker at Orange Street on 9.8.1951. James Payne. Civil Service Christian Union. In 1936 J. Payne of the Ministry of Labour (Kew) was a member of the CSCU Council, due to retire in 1939. On 13.7.1957, Pastor James Payne, Minister of Ebenezer Strict Baptist Chapel, Richmond Street, Brighton 7, Sussex, wrote to Edwin Roberts offering a file of Annual Reports of the CSCU from 1928-1938, Quarterly Records and issues of Service from January 1924 to January 1951 and a "few old records of the Kew Branch". "But I am sure that already you have decided that No. 1 certificate must go the "Troops" (Capt. Peach) more in demand on an ordinary working day than cold water in the Sahara. Wherein was he different from every other officer you ever met - from every other man you ever met? Because he never varied. He was constancy personified. One Saturday at Arncott as lunch time was drawing near a squad of a dozen men were unloading coal into the Company Coal Store. Being an internal economy detail they were working for Capt. Peach. The S/Ldr. in charge of the job asked if they might call it a day, but Capt. Peach was convinced that had the men worked better the task would easily have been finished before mid-day, and so he said "No". Sone thirty minutes later he went to examine the work, and of course, was again beset and asked whether the completion of the work could be held over till Monday. You know the type of thing - one man asking respectfully but with a reproachful eye, the other dozen men resting on their shovels registering with mute appeal. He refused; but came back into the mess rather upset at having to be what he considered, so hard hearted. He told us, as though defending his action, that the men had known from the beginning that the work had to be finished that day. They should have worked harder.....etc......etc. "Look here Skipper", I said, interrupting the post mortem, "If you '--. go out now and tell that lot that they are d....d shirkers and that they b..... well have to put their backs into it and finish the job, I will give you a guinea. One guinea if you tell them the truth - with due emphasis on two little swear words, part of War's artillery". But Capt. Peach would not - not even to make a guinea. Up jumps Andy, grabs his hat, "Give me the guinea" he says; but Clive beats him to it, "I'll do it for fifteen bob"... Hem shouts "twelve and six". Andy, seeing good money going west, calls out "Ten shillings"... seven and six.....five shillings..... down it dropped. Finally Clive, counting out how many free cigarettes he could get for half a crown, shouts out with an air of finality, "Two shillings and sixpence". But Hem with a fierce look of pleasurable excitement in his eye, says, "Dash it, all, I'll do it for nothing ! It will be a pleasure ! Spurgeon used to say he envied the Devil those short handy words; Capt. Peach went one better, he did not even envy him, he did not need them, those short handy words - he had no use for them. One September morning in France in the year 1915 at 5.29 a.m., on the 25th. Day of that month, Lt. Peach and I were near one another - though .,, we did not know it - all tensed up waiting for zero hour. For four days the guns had blasted and battered the enemies lines in front of Loos, Pas de Calais, and now the little tumbler was to drop that was to unloose the giant machine. In that fight Lt. Peach of the 8th. Devons was wounded and lost his right arm; one of his proudest memories being that he went forward with the Guards Division. (Consider that memory as a stimulating thought and source of power through life). It is not to be wondered at then, that when War's clouds rolled up again to overcast the World he immediately volunteered and within a fortnight of the declaration of War was back in the Army. Once, during one of our long chats together he told me that he was "Glad that he had been born during this period of two world wars, even though he had had to pay so heavy a price." As a writer he knew that the world torn by hatred and meanness was as true a picture of the world as the vision engraved on our minds by the wishful thinking of the Victorian Era. (Were not the hatreds and meannesses balanced by the great wave of brotherhood and high courage that swept the world? ; Peach was not afraid of war either for himself or for the world - Not even War could make a breach in the wall of his faith - and yet a lover of peace if ever there was one - A man who would not win a guinea by making use of two little war-like words. Yes, the N.C.C. certificate of Appreciation No. 1. Copy must go to Capt. Peach: It could not possibly be given elsewhere. Captain Allen L. Perry, MBE, MC, RA. Secretary The Army Scripture Readers and Soldiers and Airman's Christian Association. Assisted the formation of the Finsbury Branch and took a continued interest in the development of the United Nations Witness Team and Revival in Our Time. Brethren. Endlesham Hall. Fred Pontin Civil Service Christian Union. Missionary to Ireland. 7.12.1992 Letter from Esther and Fred Pontin (Soldiers' & Airmen's Christian Association) has, attached, small tracts containing war time and pre-war experiences. Rainey, R. 1994 The Amen God M and M Publishers, Canada. Inscribed "Eddie Ps.119:65, Les Rainey". Chapter two (His Guiding Hand) is by Audrey Rainey, Les Rainey's first wife, and includes her description of meeting Les and three other members of the United Nations Witness Team in a London restaurant. G. Ritchie Rice. (born 31.7.1881, died 14.2.1982) A Vice-President of Civil Service Christian Union. Younger brother of P.C.Rice. Christian Brethren (Dulwich Assembly) and Hamilton Evangelical Church, Bexhill. "born into a Christian family, his mother was the daughter of George Morrish who was a friend of J.N. Darby and William Carey". (Sudan Interior Mission magazine. 3rd quarter 1982). Service October 1954 p.61: "Mr Rice became a member of the ... Civil Service Prayer Union soon after joining the Civil Service [October 1899]... When stationed in London 'between the wars' he was often at Orange Street meetings and sometimes spoke there. He was frequently a contributor to Service." P.C. Rice. Died 6.3.1963, aged 86. President Civil Service Christian Union 1949 to 1960. Succeeded by Sir John Winnifrith K.C.B. Edwin Roberts, No. 3 company, City of London Forces Witness Team, Civil Service Christian Union. Brethren and Evangelical Free Church. Washington Reunion 1994, Sunbury Reunion 1995. Jean Rowe Missionary in Lagos, Nigeria, with the Sudan Interior Mission. Civil Service Christian Union. Instrumental in forming Cardiff CSCU in 1952. A few years later went to Lagos to work on the African Challenge magazine. Later joined Nigerian Civil Service. Instrumental in the formation of the Nigerian Civil Service Christian Union (later Fellowship) which held its first public meeting on 12.10.1960. With Africanisation of the Nigerian Civil Service she moved to the University of Lagos Medical School. Returned to England in 1971. Correspondence file with Edwin Roberts begins 3.8.1955 and finishes 10.2.1985. Brethren. Frank Smale ( died 3.4.1994) United Nations Witness Team 9.4.1994 Letter from Paul White, Novar Christian Fellowship, saying that Frank Smale (known by many as "Uncle Frank") had died on Sunday 3.4.1994 and that the funeral would be at Elmstead Lane Baptist Church, Chislehurst, Kent. Any donations to The Gideons. Cecil Smith (died 1987) City of London Forces Witness Team. The original team organist. Succeded by Geoffrey Brough in 1945. In 1942, Cecil and his wife, Rose Smith, had a daughter, Muriel aged about ten, who remembers the team meetings. Rose died in 1993. Muriel married Malcolm Wild. Baptist. W. L. Shand Many years Assistant Secretary of the Civil Service Prayer Union. Wrote obituary of HenryHill in October 1916 Quarterly Paper, including personal note. P. T. Shorey MBE (died 28.6.1961, aged 73) Home Office. Confidential clerk to Homes Secretaries Winston Churchill, Lord Simon and Lord Samuel. Assistant Register of the Baronetage for 16 years. Retired 1947. Chairman of the Civil Service Christian Union 1945 to 1957. Elected a Vice President in 1957 when "..the applause... for P.T. was quite exceptional" (Edwin Roberts to H.A.V. Horsey 18.2.1958). Christian Brethren. Hoxton Market Christian Mission. In 1920 he issued a magazine for young people called Marching Orders. This was absorbed into The Harvester in 1934. Frederick Albert Tatford (born 1901, died 14.6.1986, aged 85). Board of Education, Whitehall from 1917, Inland Revenue from 1928 and then Ministry of Supply from 1940 (All London based). Ministry of National Insurance from 1948 (Reading based, commuting from London). Department of Atomic Energy from 1954. Moved to Risley, Lancashire, for about two years, then returned to London. Director of Contracts and Stores for the U.K. Atomic Energy Authority (retired 1966). Brethren. Joint editor Harvester with F. Broadhurst from October 1933 to 1939. Sole editor 1939 to 1972. Editor of The Prophetic Witness. General Secretary of the Prophetic Witness Movement International 1965 to 1969, and then its Director and Chairman (to death). Obituary by F.F. Bruce Harvester August 1986. Tatford, F.A. (no date. about 1934) Early Steps in the Christian Life John Ritchie, Ltd, Kilmarnock. Tatford, F.A. 1947 Prophecy's Last Word. An exposition of The Revelation Pickering and Inglis. Tatford, F.A. 1967 God's Program of the Ages. A study and presentation of Biblical prophecy Kregel Publications, Grand Rapids, Michigan. Tatford, F.A. 1970 This is Not the Bible. Prophetic Witness Publishing House. A short, but detailed, criticism of the New English Bible, particularly because of its translation of passages with prophetic significance. Tatford, F.A. 1975 How Much Longer Prophetic Witness Publishing House. Outlining the signs (sexual permissiveness, pollution, Israel, European Common Market etc) that the second coming of Christ might be due any day. A service of thanksgiving for the life of Dr Frederick A. Tatford was held in the Lloyd-Jones Memorial Hall, Westminster Chapel on 7.10.1986 at 6.30pm. The chair was taken by Canon Harry Sutton and appreciations were given by Sir Cyril Black and A.D. Thompson, QC, MA, LLB (Canada). The speaker was his son, Dr Brian Tatford. John George Timms (born Wandsworth 16.3.1913, died West Surrey summer 1999, aged 86) of 26 Harcourt Road, Wallington, Surrey (1936 - 1942 - and other dates) was a (very) long serving membership secretary of the Civil Service Christian Union. Son of Samuel Day Timms, surgeon and Margaret (Griffiths). In the 1940s he was living with his mother and younger brother, Anthony Samuel Timms, at 26 Harcourt Road. J.J. Timms was present at an Executive Committee meeting on Tuesday 9.1.1934, G.J. Timms on 15.11.1934 when he was appointed "J.B.R.A and S.U. Secretary". Altered to J.G. Timms, Office of Commissioning of Crown Lands in Council minutes of 1.12.1934. On 18.11.1936, the treasurer (D.B.Toye) thanked Messrs Taylor and Timms for their assistance with his report. F.H. Taylor of 33 Honeybrook Road, Balham, SW12 was the Assistant Treasurer who collected the membership subscriptions of 2/- a year until he handed this over to Tims (Service July 1936). After the war, he was re-appointed Assistant Treasurer on 26.3.1946. He was still collecting subscriptions in 1981 when he had moved to 10 Meadway Crescent, Hove, Sussex. P.E. Vizard. Exchequer Office. A founder member of the Civil Service Prayer Union. He was asked to resign in 1884 because of his unitarian views. Jack Walpole, 19 Dover Street, Swindon. Member of No. 3 company of the Non Combatant Corps, who drew portraits. John R. Watson Civil Service Christian Union. Ministry of Education. Missionary Secretary and member of the Committee. John R. Watson is the son of J.B. Watson (died 1955) who was editor until his death of The Witness. A Monthly Journal of Biblical Literature, perhaps the most influential of Christian Brethren journals. Letter, Edwin Roberts to F. Gordon Smith 29.12.1986: "I met John Watson again this year at 'Filey'. He is still 'Brethren' at heart but living near Nottingham and a loyal participant in the local parish church". Gordon Watts. Civil Service Christian Union. Revival in Our Time (RIOT). Raymond Watts. Wrote "Fellowship letters" for Civil Service Christian Union from 1969, in succession to John Lidbetter. Larry Wilcox, USA. United Nations Witness Team. Washington Reunion 1994. W.H. Wood, Board of Trade, S.W. Honorary Secretary Junior Civil Service Christian Union for over ten years to January 1909 or 1910. From 1910 to 1914 he led outings of young people. Harry Young City of London Forces Witness Team. Brethren. Baptist Minister. Not a Civil Servant, but a frequent contributor to Service. Washington Reunion 1994, Sunbury Reunion 1995. Harry married Joy Saturday 17.10.1942. A photograph of the City of London Forces Witness Team was taken, showing Tom Chalmers (suit), Edwin Roberts (uniform) and Harry Young (suit and button hole) standing at the back, and (all in uniform) Olaf Ellis, Cecil Smith and Charles Parker crouching in front. Joy Young died about July 2002. Harry Young died about February 2003. Pickering, Hy. 1931 (Second edition, first was 1918), Chief Men Among the Brethren. 100 records and photos of brethren beloved Collected from many sources by Hy. Pickering, Editor of The Witness. Pickering and Inglis. Ironside, H.A. 1942 A Historical Sketch of the Brethren Movement. An account of its inception, progress, principles and failures, and its lessons for present day believers. Zondervan Publishing House, Grand Rapids, Michigan. Rowdon, Harold H. 1986 Who Are the Brethren and Does it Matter? The Paternoster Press, Exeter, for the Christian Brethren Research Fellowship. Baignent, J. and others 1988 Declare His Glory. A fresh look at our congregational worship Christian Brethren Review, No.39. The Paternoster Press, Exeter. The Believers' Hymn Book. A Collection of Scriptural Hymns for use at all assemblings of the Lord's people. No date. Pickering and Inglis, London and Glasgow. Inscribed "To Dad, with love from Eddie, June 9. 1940". Spiritual Songs, J.N. Derby, no date. Stow Hill Bible and Tract Depot, 22 Paternoster Row, London, EC4. Inscribed "Nov. 1974 To our dear brother in the Lord, Mr Howard Kilpin, with Christian love and affection from Bill and Mary Hunnisett". Hymns and Spiritual Songs for the Little Flock Selected 1856, Revised 1881, 1903, 1932, 1951. Stow Hill Bible and Tract Depot, 5 Fife Road, Kingston on Thames. Inscribed "To Howard Kilpin with christian love from H***** Light." Bell, G. W. (about 1937) Unauthorised Divisions Amongst the People of God: Clergy and Laity, and Denominational Names. Printed in Great Britain by John Ritchie, Ltd, Publishers, Kilmarnock, Scotland. Goodman, Montague, 1948 An Urgent Call to Christian Unity. This 24 page booklet called on Brethren to minister in and have fellowship with other evangelical churches. In the front there is a list of Brethren supporting the call: W.W.Allen, Ernest Barker, H.P. Barker, J.E. Billington, Douglas W. Brealey. F.F. Bruce, John Capper, Gordon N. Davidson, Lieutenant General William Dobbie, Fred Elliot, Thomas Elliot, Thomas Elwood, George Foster, Brigadier General F.D. Frost, C.S. Gill, Norman Gray, David Hill, A.E. Hutchins, R.D. Johnston, John W. Laing, D.P. Lockhart, B. Howard Muddit, Stephen Olford, B.P. Revill, Norman J. Rich, Alex. Richie, J.J. Rose, Johnston Ruddock, A. Rendle Short, A.J. Sparkes, Francis Stunt, F.A. Tatford, Ellis Tavener, Theodore Wilson, Air Commodore P. J. Wiseman. 143rd Annual Report of the Muller Homes for Children and of the other objects of the Scriptural Knowledge Institution for Home and Abroad. A brief narrative of facts for the period May 1981 to May 1982. Golden Bells. Hymns for Young People, July 1925 edition. London: Children's Special Service Mission. Cover overprinted "Civil Service Christian Union". The first major hymn book published by the Scripture Union and C.S.S.M. was Golden Bells, or Hymns for our Children, which appeared in 1890. This was revised in 1925 with the revised sub-title "Hymns for Young People". It was also used by adult congregations. In 1964 it was replaced by Hymns of Faith which was for "general congregational use...with special usefulness for children and young people's groups". C.S.S.M. also published C.S.S.M. Choruses. Number 2 appeared in December 1928 (number one had been in use for "many years" and number three in 1959. "Revival in our Time". Saturday Evening Rallies in Westminster Chapel, SW1. Every Saturday in September 1946, at 6.0 p.m. Six page yellow song sheet with 20 numbered hymns. Printed by H.T. Bowen & Co. London, W1. "Revival in our Time". Saturday Evening Rallies in Westminster Chapel, SW1. No date. Twelve page yellow song sheet with 53 numbered hymns and choruses. Printed by Bowen & Court Ltd, Printers, 24-26, Gresse Street, W1. This is labelled "CSPU Reg. 1898-1923". Probably the most battered book in the archive. It contains the names and department of everyone who joined or left from 1898/1899, with the name of the person (or whatever) that introduced them to the Prayer Union and the cause of their leaving. Both lists were maintained to 1927/1928 (not 1923). In the back is copy of a memo on an interview (2.5.1924) with Mr H.J. Wilson, C.S., Permanent Secretary to the Ministry of Labour, seeking his support and asking him to be a Vice-President of the new Union. He intended to talk to Sir Malcolm Ramsay and (probably) Mr Bowers, as he thought it desirable that it should not be one head of a department alone as a Vice-President. Over twenty blank pages have been left at the start of this Minute Book, presumably for inserting earlier minutes. The first minutes are for a meeting of the Executive Committee on Thursday 5.9.1895 at Exeter Hall (Parlour) at 5.30 pm with Mr Adney in the chair. Also present, Messrs Campbell (Treasurer), V. Peacock (Savings Bank), Stephens (Assistant Secretary), J.M. Rusk, Tate (Education Department), Mansbridge, Dios? (Patent Office), Bromley (Inland Revenue), ???? (Savings Bank) and the Secretary. The main item of business was the establishment of a branch for the 500 Boy Clerks and copyists in the Savings Bank. This committee seems to have petered out after the Great War. The rambles and outings continued (successfully) through the war and permitted ladies to come on some of the outings, with no offence. The decline in attendance seems to have come in 1918, although it picked up after the Armistice. Programs were decided for 1920 and 1921. Then there are no more minutes. Minuted rambling and outing activities begin again with the Civil Service Christian Union Youth Committee Minute Book 26.4.1938 to 22.4.1940. Quite a big book with very few entries. I counted 34. The ladies branch folded after a year, in 1919. Begins with Minutes of Special members Conference held at Orange Street Church, Charing Cross, WC on Tuesday 10th February 1931 which approved a sub-committee's report on reorganisation, with amendments to the Constitution, and elected Officers and an Executive Committee. The rest of the book consists of Executive Committee minutes. Begins with the Committee Meeting at Orange Street on Thursday 24.4.1947. The first minutes are in the hand of R.S. Code. The minutes from 11.5.1950 are in the hand of Edwin Roberts. The minutes from 13.1.1958 are typed, it having been decided to circulate drafts to committee members before the meetings. Begins with the Committee Meeting at Caxton House on Monday 27.1.1964. Begins with the Committee Meeting at St Christopher House on Monday 9.10.1972. At this meeting, "the Hon. Secretary (Mr. Roberts) referred to the difficulties experienced because of the illness of the Office Secretary (Mr Jessup) who was normally responsible for most of the mailing and duplicating. Mr Jessup had ben ill for some months..."
C.S.M.A. Gazette, December 1962 "Mr Forster then asked what the function of the Hon. Secretary was. Mr Hunsworth replied that the Hon. Secretary did all the dirty work nobody else would do..."
What he thinks they will think that they ought to have thought. The Civil Service Christian Union maintained a list of members who left the Civil Service to become missionaries outside the United Kingdom of Britain and Northern Ireland. Financial and other support was given and reports of their activities made in Service and at meetings. This is the list published in Service July-December 1961. Mrs I. Young Paris, France. 1 Extracts from the Missionary Fund Report for 1995 and full list published in Service August 1996 . Shortly before Christmas Rebe Firth, a former WEC missionary in West Africa was called Home...Mrs Averil Phipson in South Africa, who is now in her nineties, has suffered ill health for some time.